The delay in federal payments that allow Alaska’s rural hospitals and clinics access to affordable telecom services has been caused by a national rate review by the Federal Communications Commission. The state’s biggest broadband providers, GCI Liberty and Alaska Communications haven’t received payments since last year from the Rural Health Care program that pays the difference between urban and rural rates for medical customers. In 2016, the last year full RHC funding was paid, Alaska telecoms split an allocation of $122 million paid to state carriers out of a total funding pool of $400 million available nationwide, according to the FCC. National demand for the funding outstripped availability for the first time during the 2016-2017 funding year and has exceeded the $400 million limit again for the current funding year. The shortfall has led the FCC to demand more information from telecoms throughout the country to justify or explain their rates, according Healthcare-Informatics, an organization that has been tracking the issue over the past several months. The FCC took up the matter at its Dec. 14, 2017, monthly meeting when the $400 million ran out before eligible telecoms could collect on their invoices.. The five-member commission didn’t come to a conclusion at the meeting on whether to increase the size of the RHC funding from $400 million by as much as $171 million to account for inflation over the past 20 years, or to consider rolling funds over from the years when the full limit wasn’t claimed. The public comment period on the new rules proposal just closed March 5, with no placement yet on the agenda this summer, said FCC spokesman Mark Wigman. But the FCC has begun to evaluate rates charged by the telecoms. That’s where Alaska is now, along with telecoms throughout the nation, in justifying their rates. The FCC is scrutinizing each submittal and requesting more information in some cases. In the meantime, the Universal Services Administration Co., or USAC, which pays out the RHC funds, has alerted the carriers across the nation they will be paid 84.4 percent on their 2018 bill submittals. 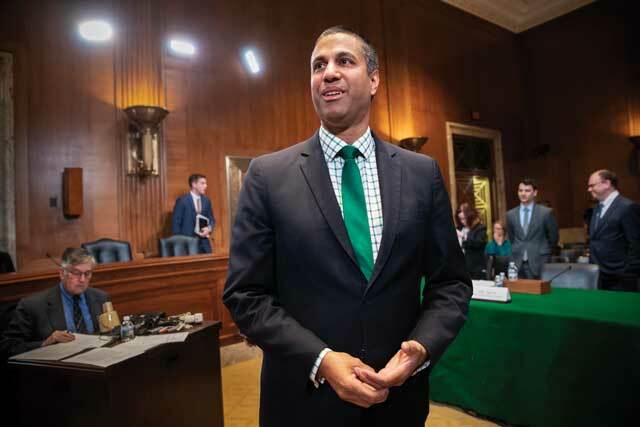 According to FCC spokesperson Tina Pelkey, Chairman Ajit Pai fully recognizes the importance of the FCC’s Rural Health Care program and supports connecting Alaskans with broadband access. “Unfortunately, some carriers have not provided the FCC with sufficient information under the Commission’s rules to justify the funding requests that the carrier has submitted,” Pelkey wrote in an email. “Agency staff have been working diligently with those carriers to correct their non-compliant submission, and those carriers are now working on providing the FCC with additional information in support of the funding requests. Critical problems with the delayed RHC funding came to light when Alaska Communications sent a letter to the Cordova Community Medical Center on May 6 threatening to cut off its internet service if nearly $1 million wasn’t paid by June 30, which represents the difference between the urban and rural rate that has gone unpaid by the USAC. Two days later, Pai wrote to Alaska Communications CEO Anand Vadapalli and told him it would be illegal to cut off service to Cordova, or any other rural health care customer, or to start charging more than the urban rate. The Cordova facility’s monthly internet bill is typically around $1,000 a month, with the remainder of the $80,000 monthly bill to be paid for by the RHC program. Alaska Communications officials stated that the company has covered the rural health care customers’ costs from its own revenue to keep 40 medical facilities on broadband for the last 11 months. Through the first quarter of 2018, Alaska Communications calculates it is owed $11.8 million in RHC funds dating back to the start of the funding year last July and it has blamed layoffs in December on the shortfall. The company is paying the costs for Cordova to a third-party carrier, the Cordova Telephone Cooperative. GCI Liberty is out $5.5 million in RHC compensation for 2017, and is still racking up additional receivables in 2018, according to company’s first quarter report. As Pelkey referenced, the FCC sent letters through its Enforcement Bureau to request the additional information from Alaska Communications and GCI Liberty in late March. All the filings by Alaska’s telecoms have been confidential so far, Pelkey said. Both GCI Liberty and Alaska Communications acknowledged the letters from the FCC Enforcement Bureau in their first quarter reports. GCI Liberty has been working with the FCC to answer all the questions, said spokeswoman Heather Handyside. “The FCC is responsible for ensuring rates are justified and we welcome the opportunity to demonstrate the unique challenges of delivering broadband service in rural Alaska,” she wrote in an email. GCI Liberty’s rates for services are adopted through competitive bidding, Handyside wrote. “As an extra step to ensure that our rates are appropriate, GCI undertook a rate-of-return cost study, which was reviewed by a third party economic consultant,” she added. The study concluded that, based on the costs to build and operate the TERRA network in western Alaska, “GCI’s rate of return is less than would be expected for an incumbent local provider delivering service to the region. GCI provided the findings of this study to the FCC and has complied with all FCC requests for information,” Handyside wrote. Both the telecoms and the healthcare customers are in a bad situation due to the unpaid bills. Cordova Community Medical Center Administrator Scot Mitchell said the hospital would have to shut down if it lost its internet. Alaska Communications had to lay off 30 workers in December and rework employee compensation in order to absorb the revenue losses in RHC funding, said Leonard Steinberg, the company’s vice president of legal, regulatory and government affairs. The hope was that the 2017 RHC funding would be allocated eventually, Steinberg said. The Alaska Telephone Association, an organization that serves its 20-some Alaska telecom members, is also concerned about the situation, said executive director Christine O’Connor. The FCC description of “non-compliant submissions” does not mean the telecoms committed any violations, she said. “That’s how they are characterizing it but we are all very careful about complying with rules. If the FCC finds any telecom out of compliance they are out of the program. It’s very disrupting and can stop funding,” O’Connor said. The RHC program was created in 1996 and has been funded at the $400 million level since that time. Meanwhile, the world of broadband and the tools in telemedicine grew exponentially each year. Alaska Communications officials are working with Pai and FCC staff on a solution to the funding challenge, said director of external and corporate communications Heather Cavanaugh. “We have provided the FCC with multiple rounds of the requested information regarding rural rates in Alaska. Of course, rates are different in Alaska than the Lower 48 because of our vast geographic distances, challenging terrain and small population,” Cavanaugh wrote in an email. The law provides that a carrier serving a rural healthcare provider is entitled to the difference between the rural rate and the urban rate. The FCC or USAC has the right to ask for more information about any carrier’s costs, but this generally didn’t occur until the 2016 funding year when, for the first time, demand for support from this fund exceeded the $400 million budget that the FCC adopted in 1997, Cavanaugh said. “So for funding year 2016 and 2017 (when demand again exceeded the budget, this time by an even greater amount) the FCC asked USAC to more closely scrutinize the rural rates and this has held up funding for a number of carriers, in Alaska but in other states, too,” she said. One problem is that the FCC is asking for measures Alaska telecoms cannot supply. “We believe our rates as submitted are compliant,” Cavanaugh said. Under FCC rules, the rural rate for telecommunications service provided to a health care provider, or HCP, must be the average of rates being charged to commercial (non-HCP) customers for identical or similar services in the rural area where the HCP is located; or the average of the published rates charged by other carriers to commercial customers for identical or similar services in the rural area where the HCP is located; or a cost-based rate approved by the FCC. “As we told the FCC and USAC more than a year ago, the first test cannot be met in most of Alaska Communications’ rural HCP locations because there is no commercial customer in the area buying the same or similar services; the second test cannot be met in many of Alaska Communications’ rural HCP locations using a single published rate for this type of service from a competing service provider. The third test is very difficult to comply with — in fact, no one ever has done it — because the advanced services we provide (high-speed IP-based managed broadband services) never were offered at tariffed or published rates, and never were the subject of cost-based ratemaking,” Cavanaugh said. Following the 1996 Rural Health Care Act, the FCC established the RHC Program to facilitate healthcare delivery in rural and remote parts of America in 1997. As a result of RHC Program funding, a variety of healthcare providers — ranging from not-for-profit hospitals to local health departments to rural health clinics, to name a few of the eligible healthcare provider types — have provided vital healthcare services in areas with limited or no access to many types of doctors and specialists. At its meeting Dec. 14, 2017, on the same day FCC commissioners officially repealed net neutrality regulations, the agency also voted to waive the RHC’s $400 million funding cap for the 2017 funding year, which runs from July 1, 2017, to June 30. The idea was to carry forward any unused funds from prior years when the fund wasn’t exhausted. Many groups, including the American Hospital Association and the National Rural Health Association, called for an increase to the $400 million annual cap, according to FCC records. Because the annual cap has not changed since the program’s inception in 1997, one consideration proposed by the FCC going forward is to adjust for inflation over that 20-year period, which would bring the cap to $571 million. The FCC also proposed reforming the agency’s definition of “rural” and prioritizing funding within the RHC program based on the remoteness of an area served by an organization requesting funding. Public comment ended on March 5, said FCC spokesman Wigman. The new rulemaking proposals could show up on the FCC meeting agenda later this summer, he said. The main answer is increasing the RHC budget, said the American Hospital Association, as even more strains are coming to the program. “Funding for broadband-enabled healthcare is needed today more than ever, and the $400 million cap established 20 years ago is no longer sufficient to meet burgeoning demand,” wrote Ashley Thompson, AHA’s senior vice president of public policy analysis and development.